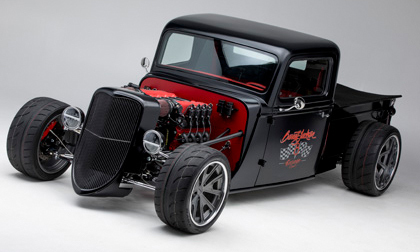 SCOTTSDALE, Ariz. – Jan. 14, 2019 – Barrett-Jackson is giving enthusiasts more ways to enjoy the high-octane automotive lifestyle with six new officially licensed products, including a new signature car care line from Adam’s Polishes and the first Factory Five Barrett-Jackson Edition 1935 Hot Rod Truck. Other popular brands that teamed up with Barrett-Jackson for official merchandise, which will be available for purchase online and on-site during the 48th Annual Barrett-Jackson Scottsdale Auction, include products from Covercraft, Smart Step Performance Mats, Proslat and Eurow. Just like Barrett-Jackson is constantly evolving to stay ahead of the collector car market, Adam’s Polishes is constantly reevaluating and testing their formulas, ensuring they are offering the most technologically advanced around. Now, Adam’s Polishes and Barrett-Jackson have teamed up to provide the perfect kit to keep vehicles shining on the road and on the auction block. Like the well-known Factory Five Mk4 Roadster, Type 65 coupe, GTM Supercar, mid-engine 818 coupe and ʼ33 Hot Rod, the Barrett-Jackson Edition ’35 Hot Rod Truck is available as a fully engineered kit for home assembly in your garage, or it can be completed by one of Factory Five’s many final-assembly partners across the nation. Barrett-Jackson branding and logos will be available throughout the truck. The concept version will be sold on Sunday during the Scottsdale Auction to kick off the new program. Established in 1971 and headquartered in Scottsdale, Arizona, Barrett-Jackson, The World’s Greatest Collector Car Auctions®, is the leader in collector car and automotive lifestyle events, which include authentic automobilia auctions and the sale of high-profile estates and private collections. The company produces auctions in Scottsdale, Arizona; Palm Beach, Florida; at Mohegan Sun in Connecticut; and Las Vegas, Nevada. With broadcast partners MotorTrend (formerly Velocity) and the Discovery networks, Barrett-Jackson features extensive live television coverage, including broadcasts in over 150 countries internationally. Barrett-Jackson also endorses a one-of-a-kind collector car insurance for collector vehicles and other valued belongings. For more information about Barrett-Jackson, visit Barrett-Jackson.com or call 480-421-6694.